Paper doilies and hearts are two of my favorite things about Valentine’s Day. We’ve combined them both together today to create this gorgeous Valentine’s Day paper flowers craft. 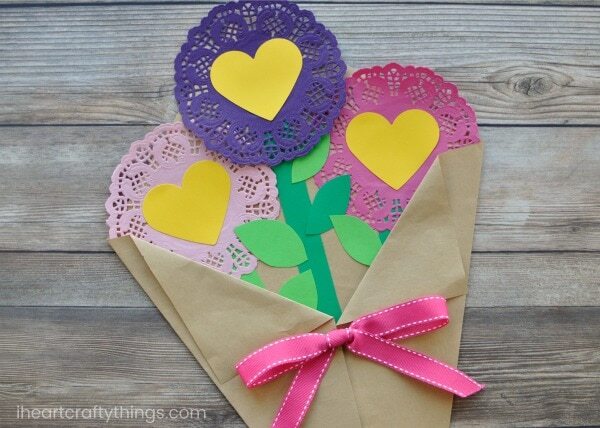 It works perfectly as a stand alone Valentine’s Day craft but even better, you can add special messages to the flowers and give this pretty paper flowers craft to someone you love for a Valentine’s Day gift or a Mother’s Day gift. Watch the full tutorial of us making this Valentine’s Day paper flowers craft before you get started. Don’t forget to subscribe to our YouTube channel so you never miss a new video! 1. 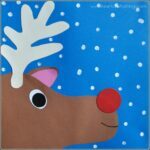 Start with a 12-inch by 12-inch square piece of brown craft paper. Lay your paper down with one of the corners up at the top. Carefully fold the square in half, corner to corner and make a crease about half way up the paper. Unfold the paper making sure the corner is back at the top how you started. 2. 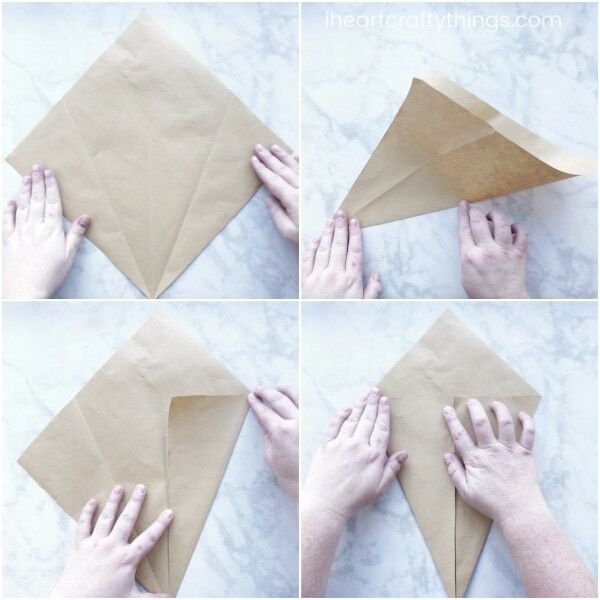 Fold the corner on your right inward, lining it up with the crease in the middle of the paper. Then repeat and fold the corner on your left inward, lining it up with the crease in the middle of the paper. Open the paper back up. 3. Glue your colorful paper doilies around the top of the craft paper. We used three doilies but you can use however many you would like. 4. 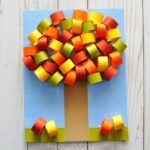 Cut flower stems and leaves out of your green cardstock or construction paper. Glue them onto your paper doily flowers. 5. Use a heart paper cutter to cut out yellow hearts (or cut them out by hand) for the insides of your flowers. Glue one heart inside each paper flower. 6. Fold the outside flaps of your craft paper square back in place. Then fold down the corners in the middle of the square down to reveal more of the flowers and to resemble a flower bouquet. 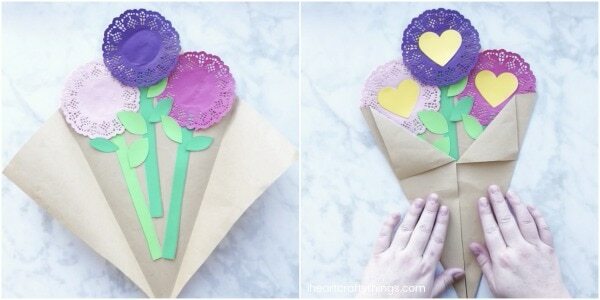 Unfold the pieces, add glue underneath them and glue them down to your Valentine’s Day paper flowers craft. 7. Finish your Valentine’s Day paper flowers craft by gluing a ribbon to the front of your flower bouquet. 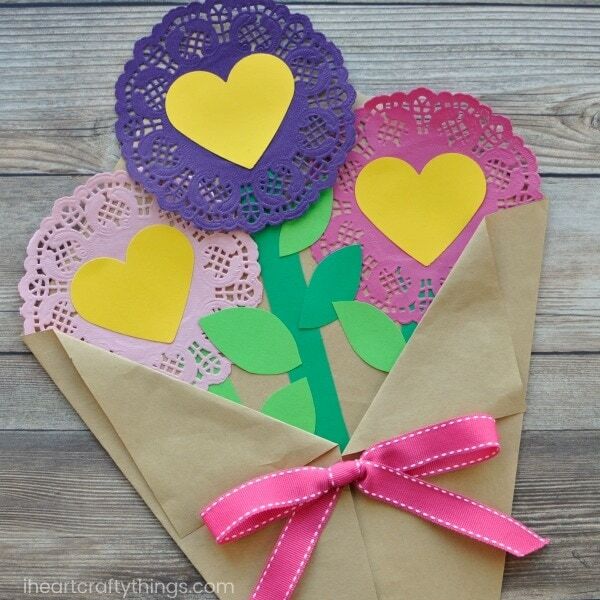 Your Valentine’s Day Paper Flowers Craft is complete! 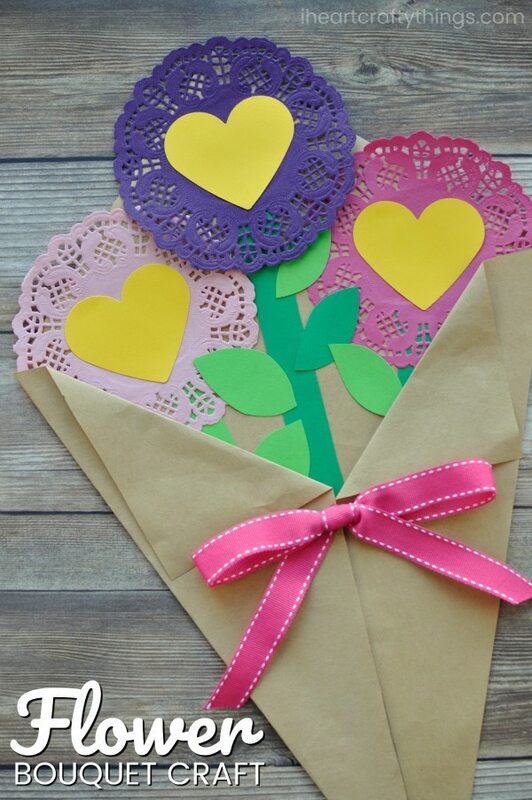 For a special treat, write love notes on the yellow hearts inside of each flower and give this pretty paper flowers craft to someone you love for Valentine’s Day. This would also make a lovely Mother’s Day gift. 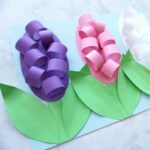 Looking for more fun paper flower crafts? Add several of these pretty paper straw tulips into a vase for a fun spring display or use them for a Mother’s Day gift. You might also enjoy creating this gorgeous folded paper sunflower craft. I don’t have a printer, is there anyway that I can purchase the patterns and the directions.